Remove bacteria, chemicals and pesticides from your fruit & veg for 10 cents per sink full. You'd be surprised at just how many times your fruit & vegetables get handled between the farm and your shopping bag before you even think about what's has been sprayed on them. Washing fruit & vegetables in water alone can be ineffecitve in removing contaminants like bacteria, dirt, chemicals, agricultural waste and waxes which are waterproof. 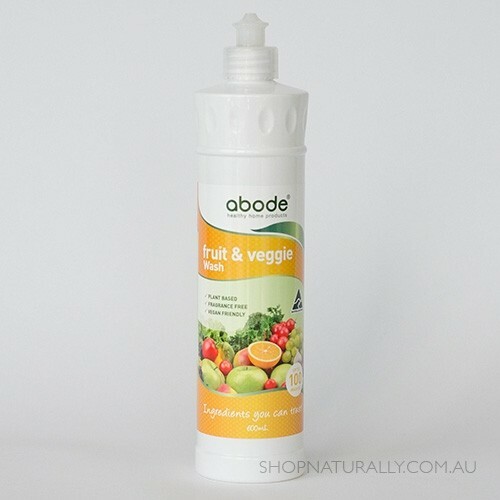 The Abode Fruit & Vegetable Wash is formulated to safely remove surface residue and contaminants and is made only with plant based ingredients. At aprox 10 cents per wash, if you do two sink fulls per week, this bottle will last you virtually all year. How to use Squirt a small amount in to a sink of water. Immerse your fresh produce and gently clean for 30 seconds. Rinse and allow vegies to dry before storing. For extra life in the crisper, we recommend wrapping your vegies in our beeswax food wraps. Ingredients Purified water, Sodium Gluconate (food grade from glucose), Sodium Cocoamphodiacetate (mild surfactant from coconuts), Lauryl Glucoside (from renewable plant resources), Grain Alcohol (plant derived ethanol), Acacia Gum, Xantham Gum, Glycerine (food grade plant derived), Sodium Levulinate, Sodium Anisate, Citric Acid (food grade). This Australian made natural cleaning products range is as affordable as it is safe. Save even more by choosing 5 litre & 5kg bulk options in the most popular products. Please note our weight limit means a maximum of 2 bulk products per order can be added. Glad I purchased this product to have alongside the rest of my abode collection. Works great and I pop a few squirts in the sink and wash all my fruits and vegetables before I store them. Gives me great peace of mind especially when the kids grap random fruits from the fridge. 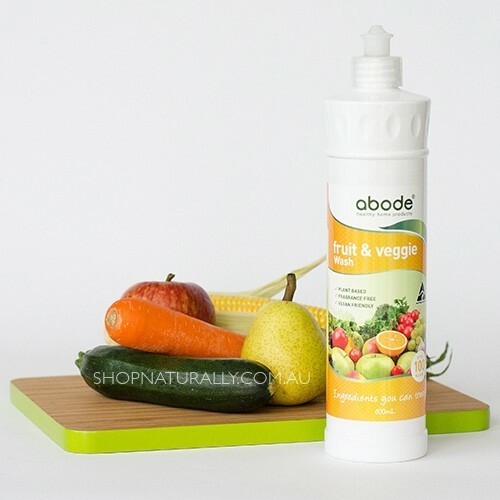 Abode Fruit & veg wash quick and easy to use. A great ready to use alternative. Quick and easy and only need such a small amount to clean heaps of fruit and veg. Peace of mind that now I am feeding my family clean fruit and veg! Have only used a couple of times after my weekly shop,so should last me over a year which is great value!